We love giving back to our Wildcat students! To support their secondary education ambitions, the Wildcat Foundation uses 50% of our funds raised each year for senior scholarships. In 2018, we were able to give $5,000 in scholarships! With your generous donations, we can continue to help our graduating seniors continue their work as they move on to college. Make a difference in a student’s life and consider creating a scholarship in your name! Contact us for more information. Congratulations to our Class of 2018 Scholarship recipients: Dylan Baez, Hailey Busic, Genesis Campbell, Nicole Durham, Carmen Gagliardi, Josue Hernandez, Jana Lapid, Jasmin Mata, Manuel Reyes, and Randy Reyes. The Wildcat Foundation dedicates 10% of funds raised each year to teacher grants. El Camino faculty members are able to fill out an application for review by our trustees. This year, we have funded grants to help start the El Camino Food Pantry, to buy shirts for our student ambassadors, and to help send our AV students to an out-of-state competition. With cuts in education funding each year, our help is needed more than ever! 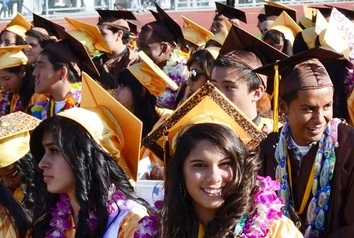 We strive to help all El Camino students reach their educational goals. Please consider becoming a donor today!